An amazing wildlife, a breathtaking natural diversity and great traditions: Africa has it all. No matter if the Northern or the Southern countries, Africa simply makes you fall in love. Many people and maybe you, too, don’t know what the world’s second largest and second most-populous continent has to offer. But thinking about it, Africa has everything you love about traveling. From the tropical rainforests to the signature savannah of the Serengeti to the pure desert to the beautiful mountains and canyons: Africa has landscapes you shouldn’t miss in your life. Overall, Africa counts 54 sovereign countries which are all different on its own. For instance, Morocco offers the desert and vibrant cities. Namibia shows you how to go best on a wildlife safari tour and South Africa makes it hard to ever leave with its breathtaking views. But besides the diversity of the countries, there are also lots of activities you can do to experience the continent. So you can venture into the Sahara with a Tuareg caravan, walk through the jungle to watch gorillas or relax on tropical islands in the Indian Ocean like Mauritius. Whatever adventure you want to do, Africa can make it even better. Accommodation – From luxury safari tents to fancy bush lodges to standard backpacker dorms, the options for accommodation in Africa are big. So if you like it exclusive and more special you can expect costs around 90€ (102$) per night in a lodge. If you like it simple and cheap you pay up to 20€ (23$) per night in a dorm. But the cheapest way is still camping (up to 10€/11$ per night). The facilities are given, good and safe. Food – In lots of accommodations and national parks barbecues are available. So you can make your own meal which basically doesn’t cost a thing except the food. Besides this, you usually pay around 20-25€ (23-28$) for a meal (a 10% tip is appreciated). In the supermarket the prices are pretty much European standards. 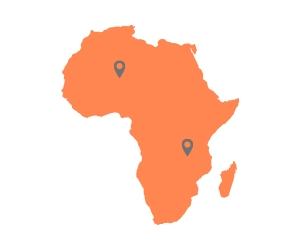 Transportation – The good things about traveling Africa: you always get from A to Z. Probably the most popular way is traveling by car. Although it’s more flexible, it can also get exhausting sometimes. If you don’t want to drive by yourself, you can still take the bus. It’s cheaper than renting a car. But the problem here is that you might not get a seat, but sit in the aisle instead. So the best option is Uber which is very cheap – especially in South Africa. Negotiation is the key For most taxis and busses, you can negotiate your fare. So always agree to a price first. That can save you lots of money. Also be aware that for big busses your ticket already includes a baggage fee. So don’t pay for it again. Book accommodations in advance Peak season is between May and October. If you travel during this time, make sure you book your rooms in advance since in some areas like the desert accommodations are very popular and likely sold out. Don’t get fooled In Africa you find people who wants to sell tour tickets for free and charge you more than usual in the end. Also there are some who sell expensive fake products. Just make sure you don’t fall into a trap. Otherwise you pay more. Avoid getting help There are always people who pretend to be nice. For example men who want to carry your luggage at airports or bus terminals. It's their business to ask for your money afterwards. So don’t agree to anything in the first place. Safety is always the main topic when it comes to traveling Africa. Well, I can say it’s as save as it is in other countries. But just a few tips to make your vacation more stress-free: Wear a little shoulder bag where you put your money, leave expensive things at home and don’t walk the streets at night. If there is a night you have to walk home, better take a taxi or Uber. Also be aware of pickpockets when you visit a bazaar or big public places like the train station. But don’t worry. There exist pickpockets as everywhere else. Besides the safety, there are some more tips I can give you. If you ever wondered, if the Africans can understand you, they can. One of the official languages is English. But it never hurts to learn some of the local key phrases. Also the African people are one of the happiest and nicest people I’ve met. They greet you, smile all the time and really want to start a conversation with you. It’s just an incredible feeling to experience this kind of friendliness. Another great tip is to be organized if you want to travel through many different African countries. It will not just save you money, but also time, if you can arrange your visas before. Find here all the visa details you need for your next trip. In addition, don’t panic about your health when traveling to Africa. Just check with your doctor what kind of vaccinations you need. But in some countries a Yellow Fever vaccination is required. And don’t forget to bring bug spray to avoid itchy mosquito bits. Also make sure you don’t try one of the tempting African lakes. There can be lots of parasites in there. You also should avoid drinking water from the tub although it’s possible in South Africa and Namibia.